A few days ago I had the opportunity of paying a visit to Spaghetti Kitchen and trying out their latest offering to all Italian foodies alike, “Make Your Own Pasta” Festival. Situated in a plush corner of the Pacific Mall in the Tagore Garden locale, the restaurant and its other branches in the National Capital Territory region (such as Noida, Gurgaon Sector 29, and others) and the country are offering its clientele a chance to mix and match their pastas, right from the pasta type to the sauce and the choice of vegetables and meats to be added. Upon reaching my destination, Mr. Govind, the area manager for the North India zone, guided me graciously through the range of various culinary choices as provided in the new menu specially crafted for their festival, which aims to cater to all kinds of choices, and to avoid the miscommunication and consequent confusion between chefs and their customers. Thus, it also provides a much welcome break from the monotony presented by the standard pasta menu, and helps bring about new food innovations as well. The festival started on the 15th of December last year and is continuing well into the new year, till the 31st of January. Spaghetti Kitchen has an open-air kitchen and bar, which is certainly an added bonus for the curious mind and the hygienic consumer. The restaurant certainly scores well on the ambience, with the semi-rustic Italian interiors, comfortable wooden decor, and the soft relaxed lighting all complementing each other. The music was neither too overwhelmingly loud nor exceedingly soft, and comprised mainly of upbeat Italian folk music and other lively global tunes. After much consideration, Mr. Govind suggested that I go about the festival by sampling random combinations, much in the fashion of a blind taste test, and then decide whether the experience was worth it. My pasta journey started off on a sumptuous note, with a complimentary basket of different types of breads fresh from the oven. They were deliciously moist, crisp, and whole wheat in their composition. In no time the meticulously put assortment of breadsticks, flavoured round breads, and soft miniature buns was over, along with some strawberry and kiwi flavoured margaritas, which were sweet, light, refreshing to the palate, and ample in their natural taste, with an ingenious sprinkling of sugar on the rim. The servers were well-spoken and served me small but adequate portions of each combination to sample so as to minimize wastage, after describing to me the ingredients and the cooking methods used in making each dish. I first tried the penne pomodoro piquante, a classic red sauce pasta preparation cooked in balsamic, and topped with burnt dried chillies and capers. It was earthy and tangy in its aroma and taste, and was neither too hot nor too spicy. 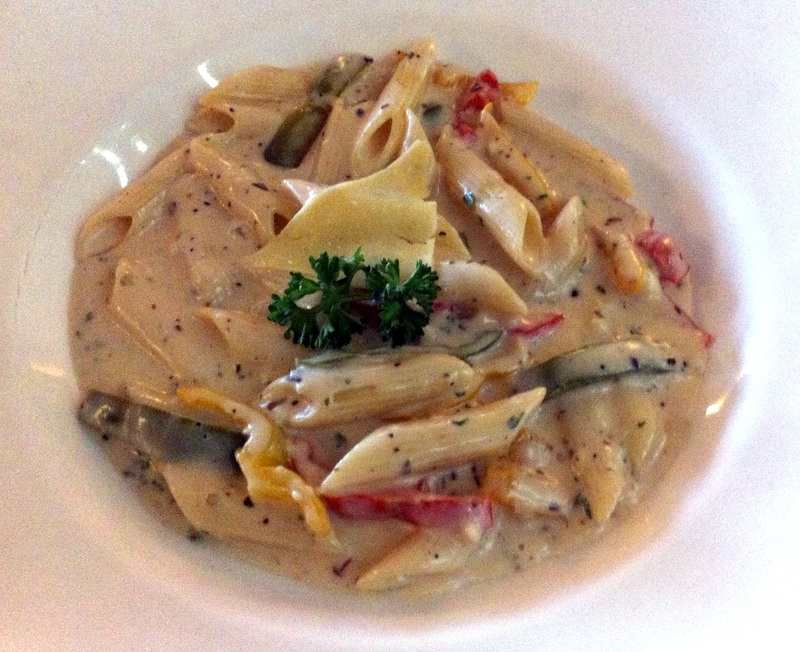 Next I had the blackened chicken alfredo fettucine, a white sauce pasta which was super cheesy, soft and easy. This dish came with a very liberal but proportionate serving of braised chicken, which was tender, juicy, and crispy, and was cooked and spiced to perfection, and is simply a delight for the non-vegetarian fine diner. I was served a marinara next, a red sauce pasta dish comprising of the whole wheat spaghetti, which was a much needed healthy twist in my Italian indulgence, and wholesome in flavour and pleasant in texture as well. The marinara, as the name suggests, comprises of calamari (a fried squid preparation) and other mixed seafood, and contains pickled onions, olives, and capers in addition to its non-vegetarian components. It was certainly a different kind of Italian delicacy, and added zest to my culinary experience in the city of Delhi where you mainly get vegetable or chicken variants of pasta. The seafood was wonderfully incorporated into the dish, and while none of the pungent smells that one associates with fish was present anywhere, its unique taste and aroma were intact. 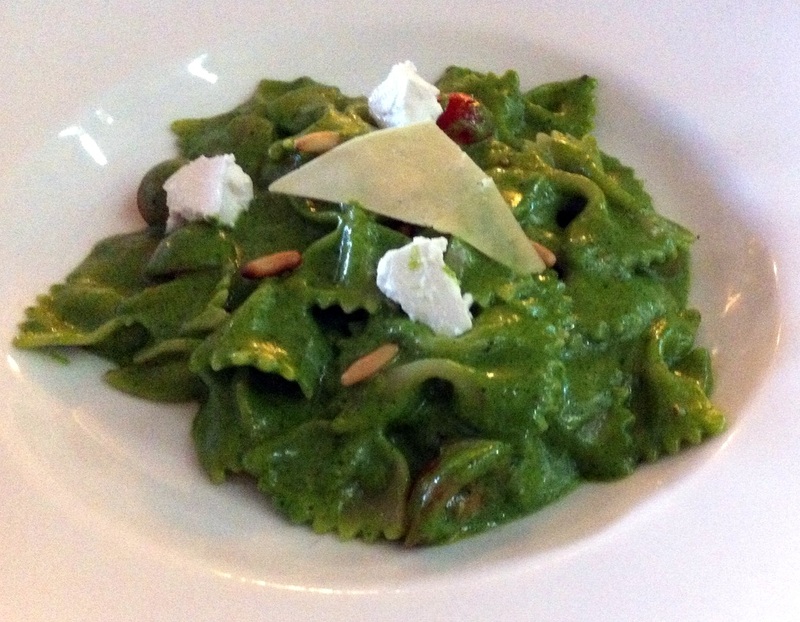 I had the pesto feta next, a vegetarian pasta dish cooked in the classic Italian green basil and garlic infusion as the name indicates. It was rich and creamy, delightfully refreshing to the taste buds, and topped with chopped cherry tomatoes, pine nuts, and melting chunks of feta cheese. The pasta type used in making the pesto feta was the farfalle, which literally means “butterflies” in Italian and is distinguished by its bow-tie shape. The classic carbonara followed after this, made with spirelli pasta cooked along with farm fresh ham and bacon in a thick egg and white cream sauce. In the meantime, I had a steaming hot cup of cafe mocha, which was light and frothy throughout, and abundant in its aroma and flavour. Since I am partial to extra milky and substantially sweetened caffeinated beverages, the cafe mocha was a light and nice accompaniment in the middle of my meal. I concluded my journey of pastas by thoroughly relishing the smoked vegetable white sauce pasta cooked with bell peppers, zucchini, and other vegetables along with penne pasta in alfredo sauce. I had another round of beverages, and enjoyed a virgin mojito and a cold coffee mocha with equal gusto. The mojito was served in a tall glass with a straw and diced lemon, and was minty, cool, and revitalizing after all the heavy eating. It was garnished with fresh mint leaves and crushed ice on the top which gave it a vibrant slushy zest. The cold coffee was much similar in its presentation, and was an easy-to-sip slush of milk chocolate and coffee blended together in perfection. On Mr. Govind’s suggestion, I tried some other specialties off Spaghetti Kitchen’s standard menu. The all vegetable pizza proved to be something that I came back for second helpings. Staying true to the original Italian thin crust pizza, the slices were toasted to a nice light brown with plenty of mushrooms, herbs, corn, olives, sundried tomatoes, and bell peppers as topping and melted cheese. While it certainly differed from most deep dish and thick crust pizzas as made by commercial food chains such as Pizza Hut and Domino’s, it was a much better gastronomic experience with its crunchiness and earthy flavours. I was introduced to the brilliant head chef, Mr. Ajay Verma, and thanked him for his wonderful food creations. Much to any foodie’s delight, I made a grand finish with a sumptuous dessert course. 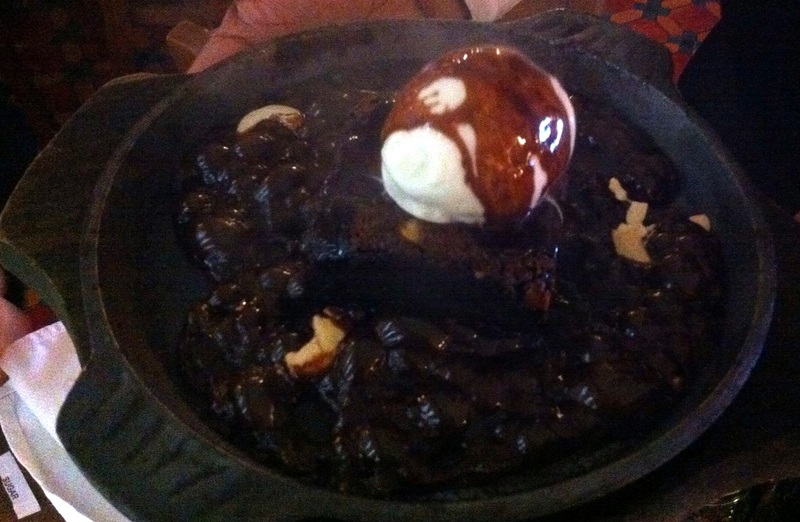 The sizzling brownie satiated my sweet tooth with its marvellous presentation, rich flavours, and warm, gooey texture. It consisted of a soft chocolate brownie, topped with a scoop of vanilla ice cream and dried fruits and nuts on a hot iron pan. My server brought it on the table along with a small pot of chocolate sauce, and poured it all over the dish, and one can only eat the end result to believe it. I also had a small croissant, which was oven fresh crisp on the outside and buttery on the inside. Finally I tasted the tiramisu, which had a soft creamy consistency and a slightly milky and sweet taste all through. Staying true to the classic version, this tiramisu was also coffee flavoured, and was served in a huge glass with coffee powder sprinkled on the top. Spaghetti Kitchen was a whole new eating out experience, and I highly recommend everyone to go and try out their pasta festival. It is a novel concept with a lot of potential, and an opportunity that should not be missed by any Italian food lover currently in the city. It is a fine culinary experience, one that will leave you and your taste buds comfortably warm and fully satisfied by the end of your visit. So go and visit your nearest Spaghetti Kitchen outlet now, and indulge yourself in some heavenly pasta goodness.